Should You Buy The St. Joe Company (NYSE:JOE)? The 700+ hedge funds and money managers tracked by Insider Monkey have already compiled and submitted their 13F filings for the second quarter, which unveil their equity positions as of September 30. We went through these filings, fixed typos and other more significant errors and identified the changes in hedge fund positions. Our extensive review of these public filings is finally over, so this article is set to reveal the smart money sentiment towards The St. Joe Company (NYSE:JOE). The St. Joe Company (NYSE:JOE) was in 15 hedge funds’ portfolios at the end of the third quarter of 2018, experiencing a small increase in hedge fund sentiment in recent months. There were 14 hedge funds in our database with JOE positions at the end of the previous quarter. Still, the number of smart money investors long the stock wasn’t enough for it to be included in the list of 30 most popular stocks among hedge funds in Q3 of 2018. In today’s marketplace there are numerous indicators investors use to analyze publicly traded companies. A duo of the most under-the-radar indicators are hedge fund and insider trading indicators. Our experts have shown that, historically, those who follow the best picks of the elite hedge fund managers can outpace the broader indices by a solid margin (see the details here). “JOE owns approximately 170,000 acres, 67% of which is within 10 miles of the Gulf of Mexico. 120,000 of the 170,000 acres is contiguous within Walton and Bay Counties and surround 15 miles of the US Intracoastal Waterway and Great Northwest Florida Beaches International Airport. JOE has built a home grown management team, a fortress-like balance sheet including $250 million of liquid investments, and a profitable pipeline of projects to build homes, apartments, limited and full-service hotels, clubs and resorts, commercial villages, marinas, manufacturing and office spaces, and all else that is needed for Northwest Florida coastal work, life, and play. Now, we’re going to go over the new hedge fund action surrounding The St. Joe Company (NYSE:JOE). Heading into the fourth quarter of 2018, a total of 15 of the hedge funds tracked by Insider Monkey held long positions in this stock, a change of 7% from the second quarter of 2018. 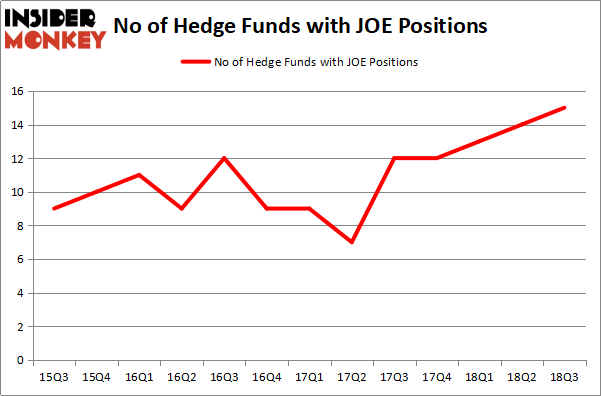 The graph below displays the number of hedge funds with bullish position in JOE over the last 13 quarters. With hedgies’ positions undergoing their usual ebb and flow, there exists an “upper tier” of notable hedge fund managers who were increasing their stakes considerably (or already accumulated large positions). 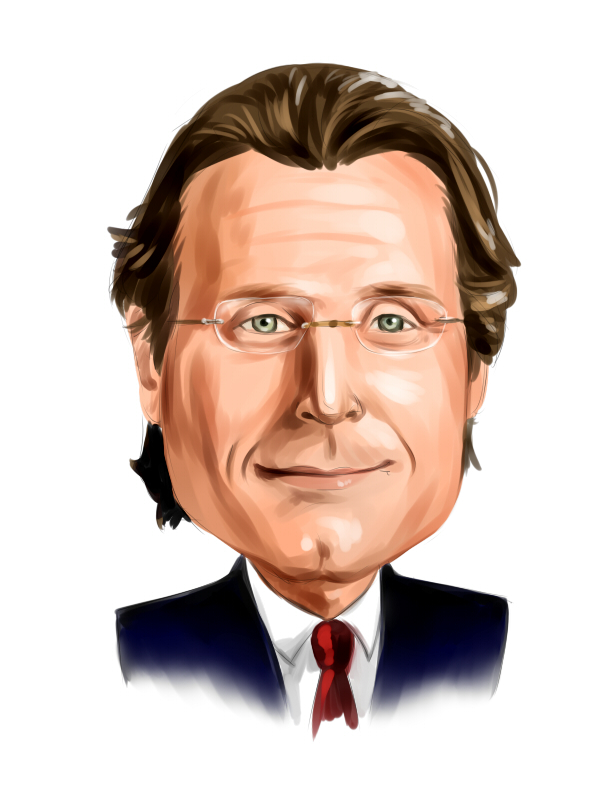 When looking at the institutional investors followed by Insider Monkey, Fairholme (FAIRX), managed by Bruce Berkowitz, holds the largest position in The St. Joe Company (NYSE:JOE). Fairholme (FAIRX) has a $460.2 million position in the stock, comprising 76.8% of its 13F portfolio. The second largest stake is held by GAMCO Investors, led by Mario Gabelli, holding a $26.8 million position; 0.2% of its 13F portfolio is allocated to the company. Remaining peers with similar optimism include Chuck Royce’s Royce & Associates, Israel Englander’s Millennium Management and D. E. Shaw’s D E Shaw. Consequently, specific money managers have been driving this bullishness. Renaissance Technologies, managed by Jim Simons, assembled the most outsized position in The St. Joe Company (NYSE:JOE). Renaissance Technologies had $0.7 million invested in the company at the end of the quarter. Paul Marshall and Ian Wace’s Marshall Wace LLP also initiated a $0.5 million position during the quarter. The other funds with brand new JOE positions are Ken Griffin’s Citadel Investment Group, Alec Litowitz and Ross Laser’s Magnetar Capital, and Mike Vranos’s Ellington. Let’s go over hedge fund activity in other stocks similar to The St. Joe Company. SunPower Corporation (NASDAQ:SPWR), Vista Outdoor Inc (NYSE:VSTO), and Duluth Holdings Inc. (NASDAQ:DLTH). This group of stocks’ market caps are similar to JOE’s market cap. As you can see these stocks had an average of 10 hedge funds with bullish p ositions and the average amount invested in these stocks was $46 million. That figure was $512 million in JOE’s case. Vista Outdoor Inc (NYSE:VSTO) is the most popular stock in this table. On the other hand SunPower Corporation (NASDAQ:SPWR) and Duluth Holdings Inc. (NASDAQ:DLTH) are the least popular ones with only 10 bullish hedge fund positions. Although The St. Joe Company (NYSE:JOE) wasn’t the least popular stock among these, we would rather focus on stocks hedge funds are piling on.